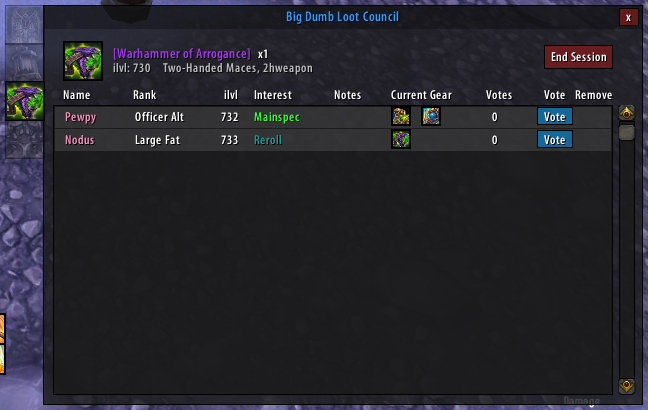 Big Dumb Loot Council is an addon that helps to assist loot councils in gathering item interest, comparing upgrades, and voting on who get's loot. I wrote this addon because the other options are either broken, missing features, or far too feature heavy. This is a lightweight low footprint replacement. Simply loot a boss in a raid to use the addon. Members of the loot council see a window that shows who's still considering loot, and which members have rolled. 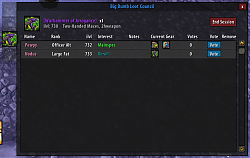 The loot council can view the player's other items for comparison and vote on who should receive the piece. There is a localizations.lua file for localizing other languages. If you'd like to help localize to this run on your client, simply edit the file or submit your changes to the comments section. Fixed relic and itemlevel tooltip scanning. Should resolve all relic issues on all clients. Added localization field for "Warforged" and "Titanforged"
Switched all itemUID to itemLinks in an attempt to fix new itemcaching issues introduced by blizzard in 715. To make sure that everything works well, you may have to loot the boss multiple times to make roll windows show for everyone. Permafix in the works. Fixed bug where item interest went to wrong version of item. Added capability to get current sessions / info after reloading UI or exiting a loading screen. 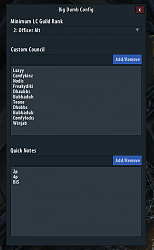 - Buttons will now appear that allow you to add a couple of common notes to the end of any custom notes. Default buttons are: "BiS", "2p", and "4p". You can add more from the config. Fixed/added configuration for custom loot council members, that will always persist. Fixed dropdown menu for minimum loot council rank. Fixed bug in relic/mainhand compare. Note: any players who are not on this version will be unable to use the addon if the masterlooter is on this version or higher. Fixed handing out to disenchanters, it should now always send out the correct item. Should have fixed all xrealm issues in this build. Also fixed the enchanters functionality and handing out loot. Fixed bug with handing out loot through the UI. should now work again on the same server, i'll have a fix out tonight for the xserver issue. Added a disenchanter window (untested) where players who have this version and above who are near max level enchanters will appear under a menu for loot awarding. Added ability to assign loot through the loot council window. If you're the master looter, simply click their name to get the prompt. Fixed dumb bug where hands show for every piece. Fixed showing itemLinks instead of itemID's. Changed the way the addon handles passing items. It should now use itemID and correctly show warforged, gems, etc. Added version tracker, /bdlc version to test the raids version. Tested it tonight, works like a charm. Thank you! The most recent update should fix this, have you updated tonight? A friend have tested it tonight, both raid leader and he have the latest update, relics still don't work with Italian client. Update 1.95, relics still not showing up. Last edited by jupyter83J : 02-17-17 at 02:24 PM. 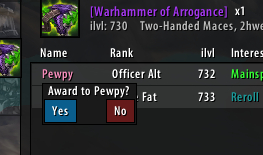 Is this only viable if raid is on Master Looter, or can someone link a tradeable item to an officer to then be linked for others interest / voting? If the raid leader type /bdlc start [itemlink] it'll start a session for that item. You can shift click the item to put its link in the chat. seems that Relics are still not showing with Italian client. I can't test it personally yet, but a guildamate tried it and when an Arcane and a Frost Artifact Relics dropped, simply didn't showed up on the loot window (tier now work fine); He didn't tell me if a lua error occurred when the relics dropped from the boss. Could the apostrophe on the localized string that I gave you be the problem? Did some test on tonight heroic farm: warforged and titanforged localization work fine, but relics didn't work, we have tried changing l['artifactRelic'] = "dell'Artefatto" with "Reliq" "Reliquia" "Artefatto" (full italian relic description in tooltip is "Reliquia XXXX dell'Artefatto" where XXXX is the element) and even when typing /console scriptErrors 1 no LUA error occurred. there is a lua error when it comes to tier items, which prevents it from working with tier items. you use "tierHelm" leading to a nil result for the strfind. You missed the "warforged" and "titanforged" localization and use double "['artifactWind']" in the localization file and not "['artifactWind'] and ['artifactStorm']"
to improve PriestVirikas, the german Storm relic is called "Stürmisches" not Sturm, the other stuff seems correct. For the frame/button localization in my opinion no translation is required, so I didn't add that. Last edited by PriestVirikas : 02-03-17 at 05:21 AM.